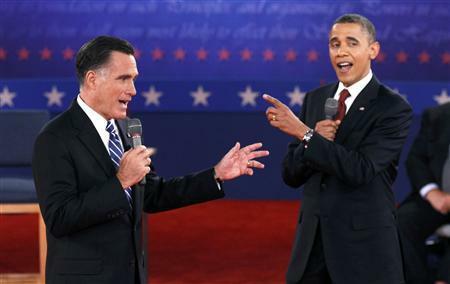 Joel's Jottings: Obama or Romney? Who? Four years ago, around this same date just ahead of the US Presidential elections, I had written this little post on my blog here. My remote amateur armchair analysis turned out to be somewhat right. And here is my 200 fils worth again. Just hours before these new elections, CNN final polls of 4 Nov 2012 ( pdf file here ) say that both contenders are tied. Romney 49% and Obama 49%. So, a very close finish is being predicted. But opinion polls may not always turn out right, in real. Who stands where? If we wish to strictly go by US Economy analysis, we can look at what the world’s two leading authorities on it – Financial Times and Economist – say. The Economist’s editorial of 3 Nov 2012 says “America could do better than Barack Obama; sadly, Mitt Romney does not fit the bill”. And the article ends with the lines, “…for all his shortcomings, Mr Obama has dragged America’s economy back from the brink of disaster, and has made a decent fist of foreign policy. So this newspaper would stick with the devil it knows, and re-elect him”. Both news-media bigwigs think Obama is the right candidate. But will the people vote for him? We will know the answer in a day or so. In the wake of the superstorm Sandy's brief whirlwind tour of his city, when Micheal Bloomberg the Mayor of New York City endorsed Obama for the Presidential race, there were a lot of jokes against Bloomberg. The climate change logic he expressed was definitely hazy. But Bloomberg, we know, was once a Presidential hopeful, and is - in his own right - a successful businessman running a successful media company. With over 20 million monthly hits to Bloomberg website, and with 427 publications using Bloomberg content, this company's big boss must have his head screwed on right, somewhere, somehow; even if the Romney camp does not think so. As individuals, or as the electors of the Electoral College, do people vote with their hearts or with their minds? We could debate it till kingdom come. But we may not get a definite answer. We can ask, what does final voting depend on? Does it boil down to charisma and gut-feel, affected by the speeches, debates and rally-strengths? Or does it boil down to the taxes you pay as a middle-class man, or as a billionaire businessman? What perspectives of the candidates will matter to US citizens who vote? Is it US Foreign Policy and specifically its stance on relations with Iran and Israel? Or is it the budget cuts to reduce deficit, or the budget increases to keep US military as World No. 1? The challenges facing the position of POTUS are far too complicated to brush off easily. The position obviously needs a person who can keep his cool, while dealing with tremendously stressful political situations - domestic and international. Contradictory as it may sound, he ought to be resolute, yet accommodating. I can see Obama being that. Not Romney. Romney, the former Governor of Massachusetts, may have had a longer stint in politics and a greater experience of running businesses. But among other things, and from the debates, he seemed a bit too aggressive on military spending and too tough on issues facing the middle east, for a well-rounded foreign policy. Many middle eastern nations have no love for US. And a very aggressive Romney stand, against Palestine, can cause a very unwholesome polarization, detrimental to US interests. I believe that the auto industry bailouts of Obama – which Romney had opposed then – have worked well and can show good results in the long-run even if they are straining the budget now. GM which had filed for bankruptcy is now, yes, now, No. 19 on Global Fortune 500 companies' 2012 list. The Obama action had saved thousands of jobs, and revitalized an industry. Pro-active government intervention is sometimes necessary even in the most capitalistic economies. Common long-term good is very important, and there is no harm in tax payers helping fellow citizens retain jobs. Hard on the pocket now, but good in the long term. We do not see a tenable alternate Romney solution. Obamacare, which Romney said he will do away with if he comes to office, is too big an effing deal to be done away with. Obama camp will not want to let go of that easily. Withdrawing troops from Iraq and Afganistan, and getting the big bad guy Osama bin Laden are plus points to Obama. So, even though I disliked Obama - for hitting out at Romney earlier to the election debates, for the lack of punch in the first debate, and for some Obama facts which turned out false, I still think he is what USA needs. Like the news magazine Economist says, I think the people of US will stick with the devil. They know that a known devil is sometimes better than an unknown angel. High Rise Buildings, At What Cost?